This document refers to Macrobond 1.13 and later. 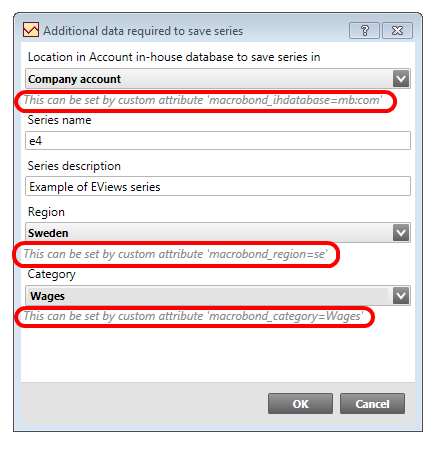 With the Macrobond add-in for EViews you can load series from the Macrobond database and you can store series to the Macrobond account in-house database from EViews. You need to have Macrobond 1.2.2 and E-Views 7.2 Enterprise Edition (Apr 29 2011 build) or later. If you are running the 64-bit version of E-Views, you need the 64-bit version of Macrobond 1.12 or later. You can pick one or more series to add to your database view in EViews. You can now work with these series like series from any other external data source in EViews. The most common operation is to export them to a Workfile. You can do this from the Object or context menu in EViews. You can store time series in EViews to the “Account in-house database” in Macrobond. The time series will then be available in the Macrobond application. To store a time series you can do “Store to DB…” from the Object menu or context menu when you have selected a time series in EViews. 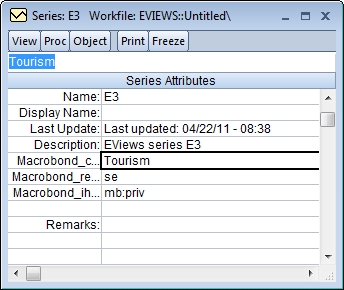 You may also use drag and drop and drop the series in a Macrobond Database window in EViews. When all information is filled in and you press OK, the series will then be stored. 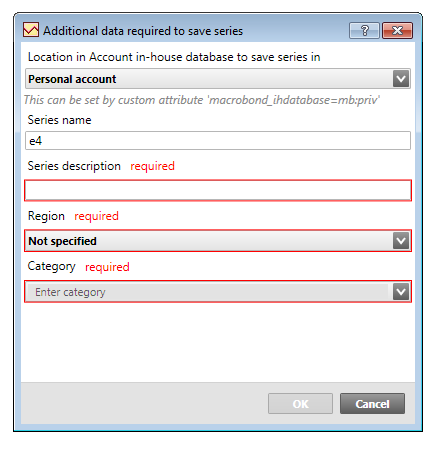 In order to avoid this dialog, which is useful when automating tasks, you can complement the series in EViews with some additional attributes: Name, Macrobond_category, Macrobond_region, Macrobond_ihdatabase. See section Labels below. No dialog will be displayed when all these attributes are present. Note: You enter new labels on the empty line above the “Remarks:” label. If you have the Macrobond application running when you save a new series to the Macrobond database in EViews, you might need to press the refresh button in Macrobond in order to see the new series in the list. Name The name of the series in Macrobond. Description This is the description of the series in Macrobond. Remarks A comment about the series. Convert_LoHi For series that have Class = “Flow”, these are Convert_HiLo=sum and Convert_LoHi=const_s. Otherwise they are Convert_HiLo=last and Convert_LoHi=const_a. Macrobond_category The Macrobond category of the series. For example, the value could be “Wages”. Macrobond_region The country or region code of the series when stored in Macrobond. This must be an existing region. The codes are based on two letter ISO 3166 codes. You can find a complete list of the supported regions at https://www.macrobond.com/go/regionList. 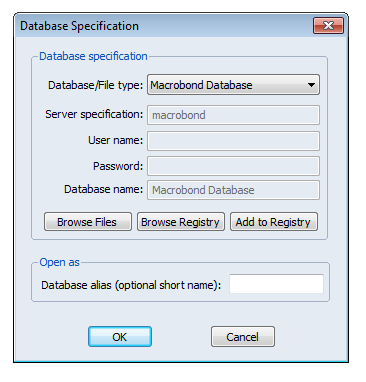 Macrobond_ihdatabase This attribute tells Macrobond where the series is stored. It can be “mb:priv”, “mb:com” or “mb:lib”. 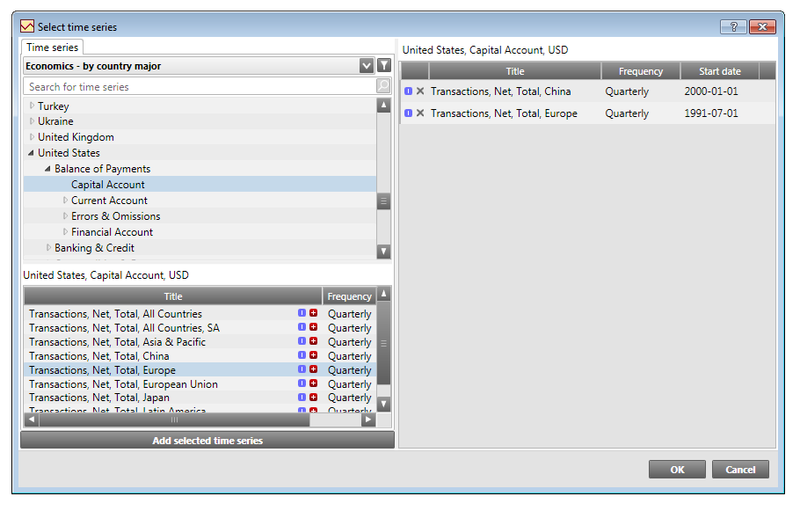 Macrobond_releasestage If present, indicates the status of the last value in the series. Can be one of advance, preliminary or final. Source The source of the data. Units The unit of the data.